18K rose gold and titanium case. 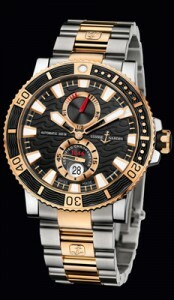 It is a 45mm case, 42 hour power reserve display, date, and automatic movement. The black dial is etched with large black waves. It features an exhibition case back. It comes on a titanium & 18K rose gold bracelet.